I’m a guy and want to cheerlead but everyone talks me out of it. What should I do? 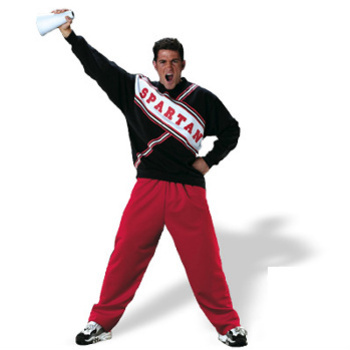 Being a guy cheerleader is fun – and it’s also a lot harder than most people think. I think it’s great that you want to become involved in such a tough sport. Here’s some information about male cheerleaders that will hopefully help you get past the haters so you can do what you love! There is no denying that male cheerleaders get a bad rap. People say that cheerleading is just for girls and “real men” should play sports like football, basketball or soccer. They feel that guy cheerleaders are weak, un-athletic and uncoordinated, and all they do is clap their hands, jump up and down and scream “rah rah rah” all day … but all of that couldn’t be further from the truth. Because you are constantly moving and doing routines, cheerleading helps improve you stamina, coordination and strength. With flips and cartwheels, there is a lot of gymnastics involved. Being more conditioned and coordinated will help you in other sports. Believe it or not, a lot of male cheerleaders also participate in other sports throughout the year. It also improves your teamwork skills and helps you learn to trust your teammates. Cheerleading also improves your confidence because it makes you learn how to perform in front of a big crowd under pressure. Has this ever happened to you? Got any good advice for Ap? Leave your comment below! Is Cheerleading a Sport? Vote! Yes - and cheerleaders are great athletes too. It's more of a hobby - not a sport.